Kidney disease and diabetes. When a doctor has a diabetic patient, he or she worries about the chances that that patient might develop microalbuminuria. Microalbuminuria is a type of kidney disease. The appearance of microalbuminuria indicates the occurrence in the kidneys of dangerous changes. Those changes lead to the development of proteinuria. Whenever a patient’s urine has an abnormally high amount of protein, that patient is said to have proteinuria. Proteinuria can be used to refer to large or small amounts of protein in the urine. The first signs of proteinuria manifest themselves when a diabetic patient has a low level of protein in his or her urine. Such a patient has microalbuminuria. A physician can check for microalbuminuria by screening for the presence of albumin in a patient’s urine. That screening should conducted at least once a year. If done according to the traditional method, such a screening demands collection of urine for a period of 24 hours. Diabetic patients should know that there is an alternative to the traditional screening method. That alternative employs spot testing of morning urine specimens. By using that alternative method, a laboratory can check the albumin to creatine ratio in the urine. Diabetics should also understand the importance of watching for symptoms of proteinuria. Evidence of one or more symptoms should send the diabetic to the phone. The diabetic knows that he or she needs undergo a screening for albumin in the urine. 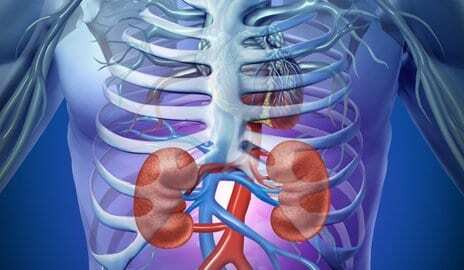 What are the symptoms of proteinuria? Foamy urine tells a diabetic that he or she has probably developed proteinuria. Foamy urine indicates damage to the glomeruli in the kidneys. A diabetic who sees that he or she has foamy urine should know that his or her urine puts out between 30 and 150 grams of protein every 24 hours. This is an abnormally high protein content for any 24 hour sampling of human urine. Why does the presence of protein in the urine signal the occurrence of kidney damage? And why do patients with diabetes need to make an added effort to watch for evidence that such damage might have occurred? A patient with diabetes needs to understand that 20% of the blood pumped by the heart goes to the kidneys. The kidneys perform a number of vital functions. The kidneys hold constant the concentration of ions in the bloodstream. They keep the volume of water in the blood constant. They remove wastes, and they insure maintenance of a proper acid/ base balance in the blood. A well-functioning kidney can help to control the blood pressure in the body. A well-functioning kidney can hold steady the level of calcium in the body. In addition, the kidneys stimulate the production of red blood cells. Each kidney has millions of tiny tubular structures called nephrons.. Each nephron is closed at one end. At that closed end, two twisted regions of the nephron have a hair pin loop between them. Two capillary beds flow into and out of the twisted, closed region of the nephron. Those capillary beds form a connection much like the light bulbs in a series circuit. The capillaries in the nephron connect the arteries going into the kidney with the veins coming out of the kidney. The construction of the vessels within the kidney allows completion of three different processes by an undamaged kidney. The kidney sends 20% of the plasma and non-cell elements in the blood into the nephron; there those elements pass through a filter. Diabetics should realize that there is glucose in the filtrate that emerges from that filter. In a healthy kidney, the amount of any substance in the filtrate shows little fluctuation. The amount of any substance in the filtrate represents the product of the concentration of that substance in the blood and the rate of filtration in the kidney. Changes in the filtration rate, changes such as those that can take place in a diabetic patient, send a warning signal to the physician who had detected those changes. After plasma from the blood has been filtered by the kidney, then the kidney starts to reabsorb from the lumen any components that must be returned to the blood. The kidney relies on proteins called transporters to carry out this re-absorption process. The set of transporters that grab the glucose molecules and return them to the blood also grab sodium molecules. Diabetics must realize that the number of transporters in the kidney remains fixed. The body can not make extra glucose transporters, when blood full of glucose passes through the kidney. Among that fixed amount of transporters, each transporter can grab only a pre-determined number of molecules during any specific period of time. As can be seen from the above paragraphs, the kidney’s ability to function properly can be hampered by the appearance of blood that contains a high concentration of glucose. The presence of that glucose forces the kidney to work harder and harder. Eventually, it fails to function as nature intended. The kidney has one other function that insures removal of unwanted substances from the blood. The kidney can detect the presence of waste products and toxic materials in the blood stream. The kidney secretes those substances into the nephron. Those substances then pass into the urine. If a diabetic has too much urine in his or her urine, that diabetic could develop an infected bladder. Bacteria love to grow in a warm environment, especially an environment with a rich source of nutrients. The warm, glucose-laden bladder of a diabetic can easily become an inviting home for bacteria. In other words, patients who have diabetes need to be concerned more than just a possible kidney disease. They must also watch for signs that they might have an infected bladder. A statistical analysis of diabetics in the United States has shown that up to one third of the patients with diabetes have or have had some type of skin disorder. Hypoglycemia can affect the skin, because the skin cells do not get the required amount of glucose. Whenever administration of insulin exceeds the amount needed for the metabolism of ingested carbohydrates, a diabetic can experience hypoglycemia. Hyperglycemia can also cause skin disorders. Hyperglycemia changes the nature of the skin environment. Normally, bacteria in the air do not want to reside on the surface of the skin. The veracity of that statement changes whenever the skin gets an added amount of glucose. The extra glucose in the blood of a diabetic can make a once forbidding section of skin seem like the ideal place for bacteria or some other group of microbes to grow. The term “skin disorders” does not refer to wrinkles or folds in the skin. An aging diabetic can expect to get some wrinkles. A once obese diabetic who has lost a great deal of weight can expect to have some folds in his or her skin. The term “skin disorders” refers to changes in the integrity of the skin. Sometimes changes to the integrity of the skin can lead to alterations in the skin pigmentation. Sometimes an area of hyper-pigmentation can be associated with a skin lesion. By examining such a lesion, a physician can better tell whether or not it should be seen as a symptom of diabetes. The next paragraphs explain what the doctor checks for. First, the doctor notes the location of the lesion. Is it on a bony surface? Is it somewhere where the bone rises above the level of the adjoining body parts? Diabetics often develop a lesion on the prominent bones of the back or the bones on the feet. Those are regions where the skin might feel particular stimuli—heat, cold or pressure from blunt objects. Next the doctor studies the appearance of the lesion. Is it round or oval? Does it have reddish or brown color? Is the skin in the lesion scaly? If the answer to all three questions is “yes,” then the doctor has good reason to view the lesion as a symptom of diabetes. Of course not every diabetic who has a skin disorder has a lesion such as the one described above. Some diabetics develop what is called Acanthosis Nigricans (AN). A diabetes patient with AN will arrive at a doctor’s office with dark, velvet-like patches on parts of his or her skin. Those patches normally form on the back or the neck. Unlike the other skin disorders, AN can not be viewed as an “equal opportunity disorder.” The percentage of diabetics with AN rises markedly among Hispanics, African Americans and Native Americans. While not all diabetics have the same chance for developing AN, all patients who have AN appear to have some type of insulin resistance. The other skin disorders most often associated with diabetes are infections. An infection develops when the body attempts to destroy an invader, usually a microbe. Bacteria and fungi are the two types of microbes that have been shown to take advantage of any opportunity to grow and to reproduce in the body of a patient with diabetes. Although one-celled organisms, bacteria are the most abundant and the most pathogenic of all the known microorganisms. Not all bacteria harm the body. Some bacteria perform useful functions within a healthy body. Other bacteria, what might be called “bad” bacteria, release harmful chemicals. Some of those chemicals digest body cells, and other chemicals disrupt specific body functions, causing disease, and sometimes death. Bacteria find the high glucose levels in the blood of a diabetic to be an excellent source of food. A physician can expect to see some of his or her diabetic patients present with a stye. A stye is a bacterial infection in the glands of the eyelid. Not all bacteria choose to grow in the glands of the eye. Some bacteria take up residence in area of the skin that holds a hair follicle. When bacteria grow around the hair follicle of a diabetic, their growth can lead to formation of a boil. While no bacterium has more than one cell, a fungus can be either a one-celled or a multi-celled organism. Some of those cells form thread-like fibers. Other cells form spores, the structures that allow fungi to reproduce. When fungi have access to an inviting environment, they ramp-up the rate of their reproduction. The fungal infections that most often complicate the life of a diabetic are those caused by contact with a fungi-infested surface. A diabetic who wants to participate in sports should know that many such surfaces exist in the typical locker room. The fungus that causes jock itch awaits contact with a warm body. Hiding there on apparel in the locker room, that fungus welcomes contact with a glucose-laden body. The fungus that causes athletes’ foot can grow on shower walls in a locker room that wasn’t well sanitized. While male diabetics usually need to be concerned about the above-mentioned fungal infections, female diabetics need to watch for evidence of a different sort of fungal infection. Female diabetics can develop yeast infections. Such infections are usually vaginal infections. In order to understand the nature of vaginal infections, one must recall the earlier mention of “good” bacteria, bacteria that perform a useful function in the human body. Some bacteria normally prevent fungi from growing in the vaginal area. Yet the body has a fixed amount of bacteria. If those bacteria can not reproduce as rapidly as the fungi, then the fungi take over. That is what happens in the female diabetic. The high glucose levels in the blood spur the growth of fungi in the vaginal area. The woman then develops a vaginal infection. All infections, both those caused by bacteria and those caused by fungi, are treatable. The infected diabetic must consult with his or her physician. Cardiovascular disease can affect anyone. However, a person with diabetes is more susceptible to heart problems. Diabetes attacks an individual’s immune system as well as their nervous system. The blood vessels shrink and less blood flow to the heart can occur. With all the health problems that can arise, it is vital to know how to take care of the body for a long and vital life. An individual can discuss with their personal physician on what they need to do to prevent a tragedy from happening. When a person is first diagnosed with diabetes, their lifestyle must change. They will need to know how to control their issues through healthy means. Heart disease is a leading complication in a diabetic patient. It is a serious problem; however the risk can be lowered with the proper medication and lifestyle changes. Stroke takes a large number of diabetic patients each year. This is because when your blood vessels shrink, the movement is limited. An individual’s brain needs to have a certain supply of blood to keep it active. When this supply slows down, stroke complications happen. A part of the brain dies. Strokes, heart attacks and poor circulation can all be devastating to an individual as well as their families. A person that has gone through a stroke may lose their sight, hearing or motor skills. There are preventive measures than can lower the risk of cardiovascular disease in diabetic patents. It is a lifestyle change that must be made to stay active as well as vital throughout the years. Diet and exercise. Diet is a major lifestyle change for most people. However, when a person is overweight and has diabetes, the risks are much higher. With the proper diet of low sugar foods and low fat content, an individual can become healthy. An exercise regiment should be discussed with a doctor. Too much or too little may cause an individual to experience cardiac arrest. With the correct amount of each of these steps, an individual can become healthier and reduce their risks by 40%. Blood sugar. The blood sugar for a diabetic is vital for long lasting effects. When this is too high, the human body’s system begins to break down. The physician can explain what range a person should stay in. Check this often, at least 3 or 4 times a day for maximum security. As well as taking the proper medication when directed. Cholesterol. It is important to keep a person’s cholesterol at appropriate levels. There are methods and medication that can be used to stay in the correct range. Discuss with a doctor on the best techniques to keep the cholesterol in safe amounts. Smoking. Smoking can cause various health effects in everyone. 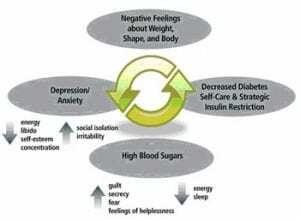 Nevertheless, it is extremely important to stop when a person has been diagnosed with diabetes. This habit can cause blood vessels to shrink, circulation to slow down even further and create new health risks as well. Patents that continue to smoke have double the chance to have a heart attack and a stroke. Blood pressure. An individual with high blood pressure is more likely to develop cardiovascular disease. A person that experiences high pressured lifestyle through home or office problems may have a heart attack or stroke. It is vital to stay clam and find relaxation techniques. There are at home kits that can assist in checking blood pressure often. A doctor may prescribe a medication that can help with this issue as well. With simple and easy to follow steps, an individual can reduce their risks dramatically. It is vital to take the proper medication, lose weight and accomplish the exercise regiment fully. Cardiovascular disease can be controlled with a lifestyle change. Foot care is ideal for the overall health of an individual. Diabetics have lower immune systems as well as nervous system breakdowns. Each person faced with the diabetes disease must take extra precautions when it comes to this feature of the body. There are several causes as well as preventive measures that need to take place for the overall health of a diabetic. Swelling, cracks, dry skin as well as itching can occur. Cuts and sores on an individual’s feet can turn quickly into an infection or even worse. Preventive measures must be taken before unexpected health problems arise. With the lowered immune system, sores and cuts can not heal as quickly. They must be treated right away or an individual may lose the proper use of their foot. The complications for improper foot care can be painful, a disruption of lifestyle and harmful in the future. They can lead to sores, dried skin as well as calluses and even ulcers inside one or both feet. Some individuals that have had high blood sugar for years can develop poor circulation as well as damage to the tendons and nerves. Skin discoloration or deformation of the toes and overall foot can be a cause for alarm. Most of the complications can be treated. However, some may lead to amputations if preventive measures are not taken. Footwear. This is a rather simple concept. Nevertheless, it is overlooked frequently. There are specialized shoes and socks that can be purchased for a diabetic’s needs. Continual damage. Certain medical issues can arise when an individual has experienced high blood sugar for a long period of time. Nerve impairment and horrible circulation can happen with continual damage to the body. Poor cleaning and maintenance. It is vital for a diabetic to understand the proper method in cleaning their feet. Lotions, soaps and inspections are important for overall excellent health care. Toenail trimming mishaps. The correct method in trimming the toenails is an important part of feet care. If you make a mistake while trimming, it may cause an infection. This will take some time to heal, if at all, because of the lowered immune system. Smoking. This habit will lower your circulation as well as your immune system even further. The release of toxins inside the body creates slower blood circulation. This, in turn, will cause an even further decrease in the blood flow in the feet. There are several symptoms that are apparent for improper foot care. It is vital to watch closely if a symptom appears. After this occurs, the correct measures need to take place. Swelling. This is a major tell sign of a problem associated with diabetes. Nevertheless, other health problems may show signs of this issue as well. If swelling does occur, look closely at other symptoms that may be present. Redness or warmth. This problem can be a sign of an infection. Either on the outside of the foot or an issue inside, infections can be very serious. If this lingers for more than a couple of days, seek a medical professional. Pain or discomfort. Major pain or a small amount of discomfort can be caused when the feet are not properly taken care of. Preventive measures can control this from happening. Cuts, sores, scraps or drainage. These types of issues can be caused by various injuries. If a person is experiencing fever, hot or cold spells or any strange sensations, a physician need to be contacted. Glaucoma And Diabetes: There are many types of complications that come with diabetes, some are painful and some are life-threatening. However, Glaucoma is one that can be cured or at least it can be helped. Diabetes affects more then 16 million people in America. Some form of eye disease affects almost every diabetic patient, there are different types of eye diseases but the most common is Glaucoma. Glaucoma is caused by the damage that is severed to retina and the optic nerve in the eye. Those who have diabetes are already at risk, however the older you are the more you become at risk for Glaucoma. Those with diabetes are twice as likely to be diagnosed with Glaucoma then those who do not have diabetes. Other diabetic eye diseases are called Cataracts and Retinopathy these are less common but are still diagnosed with diabetic patients. When being diagnosed with Glaucoma you will hear of the 3 different types of Glaucoma types. Open-angle Glaucoma is the most common of all 3 types of glaucoma known about. Open-angle Glaucoma happens very slowly and some patients do not even realize that they have it damage happens so slowly that it may not be noticed for many years. The second type of Glaucoma is called Closed-angle and it only affects just one eye and can present an increase in pressure throughout the eye. Closed-angle can cause a huge amount of pain, nausea, some visual effects have been noticed and some people have complained about seeing halo’s around certain lights. 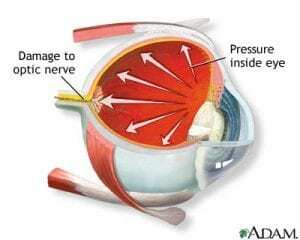 The last type of Glaucoma is called Neovascular Glaucoma and is considered the rarest type of Glaucoma types because it does not always come with sudden vision loss. Neovascular occurs when blood vessels are starting to grow on the iris itself, which is the colored part of the eyes. Once this happens fluid starts to be cut off, which then raises a huge amount of pressure in the eyes. This has become one of the hardest diseases to treat; however, laser surgery has become quite popular. Laser surgery reduces the abnormal growing vessels found on the iris. Some people however have opted for drainage implants. Drainage implants are also referred to as Valve implants, some other treatments are given by certain medical prescriptions. However, Valve treatments have taken on several different names; some refer to them as “aqueous shunts” while others refer to them as “Glaucoma drainage devices.” These implants work by allow fluid to drain from the eye or eyes so that way there will be no pressure build up. A device is placed near the eyes so that way the tube which is placed for drainage will not close up or shut down while trying to relieve pressure from the eye. Implant of today’s technology present a tubal form that helps the aqueous fluids. To more understand what aqueous means, we have to look further into the eye. There are two segments to the eye itself which are filled with fluids called aqueous and vitreous humors. The aqueous is always being refreshed and the old fluid is constantly being washed away. When you are diagnosed with Glaucoma then you might start to notice some built-up pressure forming in your eye. 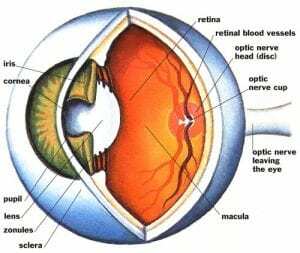 This is cause by the aqueous fluid not being able to drain properly which will in turn cause some vision problems and some pain from your eye. A procedure defined as Tonometry can help doctors and Ophthalmologists measure this pressure which is referred to as intraocular pressure. The valve implants we first developed in 1966 starting with Molteno. Two basic types were designed valved and non-valved; the valved designs are called Ahmed and Krupin while the non-value designs are called Molteno and Baerveldt. Thousands of implants have been used yearly to help patients to feel less pain. Some surgeries have been done to help those suffering from Neovascular glaucoma and nothing has been so successful more than the valve implants have. Some herbal treatments are available for Glaucoma is available on the internet; one fore instance is called Dr. Christopher’s Bilberry Eye Formula. This is a blend of herbal ingredients that helps with the circulation to the eye and with the overall treatment of Glaucoma. It also helps to repair some of the damaged vessels caused by Glaucoma, help with loss of vision during the night and can cleanse tissues in the eyes while bring antioxidants to eyes. Bilberries, the main ingredient in this formula are a family member of blueberries. Another ingredient that comes in this formula is called anthocyanosides; this is the main ingredient that will help those who have lost eye-sight through-out the night be able to see again. Other ingredients consist of Bilberry leaves, eye-bright herb, cayenne pepper and ginkgo leaf. You can purchase a 100-count bottle for $18, but in looking through-out the web you can also find lower prices. Another herbal treatment is on that has been heard of for a long time now; it has been controversial against for many years. Marijuana has been shown in many experimental researches to help to symptoms of Glaucoma. From a test in 1970, Marijuana proved a huge percentage of people who found relief of pressure from intraocular pressure in the diabetic patients who had glaucoma. Granted, this herbal drug can not be purchased, it can only be prescribed in medicinal amounts. Oregano has been scientifically proven to help prevent glaucoma from happening especially if glaucoma is hereditary in your family. It is recommended by Naturopaths to find foods that contain Antioxidants that resist glaucoma. Wild oregano is one of these foods; it actually contains far more antioxidants than most foods. One more herbal treatment that you might want to try is called Jaborandi; it comes from a tropical tree that grows in South America called jaborandi. Before the Spanish explorers arrived in South America, jaborandi was being used medicinally. Back in time around the mid- 1600’s some Spanish naturalists found the effects of jaborandi to have a tremendous affect on curing eye disease. It was actually an ingredient found in 1875 called pilopcarpine. Pilocarpine is usually formed into eye drops to help people with Glaucoma, using just one drop can take effect in 15 minutes and then will keep the eye protected for 24 hours. Try some fruits and vegetables that contain vitamin C have also been effective in lowering intraocular pressure. Some examples include cabbage, bell pepper, Brussels sprouts, citrus fruits, kale, papaya, strawberries, broccoli and guava. Naturopaths and Nutritionists will recommend taking anywhere from 2,000 to 35,000 milligrams a day. If you have Glaucoma then this is one herb that you will want to avoid, sanguinarine. Sanguinarine is found in bloodroot and may help to progress glaucoma. You could be using this herb daily and not even know about it since it is mostly found in toothpastes and mouthwashes because the herb can help to fight gum disease. You should check the label of both your tooth paste and mouthwash before buying them and using them. To help prevent Glaucoma from ever happening you can do a number of things. First you will need to make sure you are getting regular eye exams. It is recommended by The National Eye Institute that you get your eyes dilated at least once a year if you have been diagnosed with diabetes. Diabulimia is an eating disorder that can occur in people that have Type 1 Diabetes. When the person does not give themselves their daily insulin, their body will go into a starvation mode, which over time will cause fat and muscle to breakdown. This will cause weight loss and can put the person in risk for a life-threatening condition known as Diabetic Ketoacidosis (DKA). If the condition goes untreated there is a high mortality rate. Once a person is diagnosed with Type 1 Diabetes, they are put on a restricted diet, and on a daily routine of taking insulin shots. Weight gain is a possible outcome, which some people, especially teens will feel ashamed and embarrassed about. They decide skipping an insulin injection will help them get back to their pre-Diabetes weight. Diabulimia is not the same as other eating disorders such as Anorexia because the person does not have to vomit or starve to loose weight. Purging of sugar from the body through the kidneys is the same as someone who purges or vomits when suffering from Bulimia. Women with Type 1 Diabetes are twice as likely to develop an eating disorder. A reason that may be surprising is that since there is a lot of focus on what the person is eating such as the amount of carbohydrates and following a diet, they might start feeling negative about food. Diabulimia is most commonly found in teenage girls and young women. Unfortunately this trend may be gaining popularity because it is being talked about over the internet by people with Diabetes and eating disorders. Out of 450,000 women studied that have Type 1 Diabetes, one-third has skipped insulin injections specifically to loose weight. By doing so, they are risking going into coma, or even death. The damage done to the person’s body can be enormous. People who skip their insulin have higher blood sugar levels than normal. This can cause the person to become dehydrated, and fatigued along with the muscle loss. Long term affects can cause the persons Diabetes to rapidly attribute to Diabetic complications such as eye disease, kidney disease, and even limb amputations because of vascular disease. Other symptoms that can be expected due to long term Diabulimia include high cholesterol, extreme fatigue, and severe neuropathy which cause nerve damage to feet and hands. Teenagers have a lot of pressure to fit a certain image. Just one flip through a magazine or watching a television show can make your child feel self-conscious. If you are a parent to a teenager who has Type 1 Diabetes there are warning signs to be aware of. Intentionally skipping or lowering insulin doses could be because they do not want to gain more weight. Excessive exercise and an obsessive concern about weight and body image are other symptoms of Diabulimia. Eating disorders are serious medical conditions. Mixed with Diabetes it can cause long-term complications and even death. If you feel someone you love may be dealing with Diabulimia it is best to discuss your concerns with your Doctor. Sleep Apnea And Diabetes: Diabetes is unfortunately becoming a new trend. It is happening based on medical, social, and demographic forces. One of the causes of Diabetes is Sleep Apnea. It is now known as a major contributor of the disease. People who have Sleep Apnea stop breathing for 10 seconds or more on and off throughout the night. When this happens, it lowers the body’s oxygen blood levels and also disrupts sleep. People who suffer from Sleep Apnea are more likely to have Diabetes than those who do not have it. 50% of men who have Type 2 Diabetes suffer with Sleep Apnea. There are a number of factors that are involved with both Sleep Apnea and Diabetes. Stress response is one factor. When someone repeatedly wakes up from sleep and has constant interruptions of the body receiving oxygen results into stress. This makes the heart beat faster. If this occurs often, it can lead to insulin resistance, among other problems. Cortisol, which is a stress hormone, can raise both glucose levels and insulin secretion. Excess body fat is another symptom of Sleep Apnea. A high amount of body mass index which is determined by the person’s height and weight is a contributing factor in both Sleep Apnea and Diabetes. Sleep Apnea and Diabetes have been linked to a metabolic syndrome which is also known as Syndrome X. This metabolic syndrome is known as five medical conditions put together which can cause a fivefold increase in Diabetes. The five conditions are abdominal fat, high blood pressure, elevated fasting glucose levels, high triglycerides, and low high-density lipoprotein (HDL, or “good”) cholesterol. When put together, they are some of the leading factors from Sleep Apnea and Diabetes. There are treatments available for people with Sleep Apnea and Type 2 Diabetes. CPAP which is known as Continuous Positive Airway Pressure is an option that also helps Diabetes which is a proving factor that Sleep Apnea does play a role in the way Type 2 Diabetes effects people. The device used for CPAP is a small mask that goes over the nose and sometimes the mouth. It is attached to a machine that releases a light air pressure in the throat which keeps the airway open. This is an excellent way to help sleeping patterns return to normal and also improve blood glucose levels. Many doctors do not even know the association between Diabetes and Sleep Apnea. Screenings that can help someone who already has Diabetes determine if they have Sleep Apnea should be done routinely. There are a few questions to ask yourself which can give you a clue into if you have this problem. Do you snore? Do you have high blood pressure? Are you tired after a full nights sleep? If the answer is yes, you will need to address this issue with your healthcare provider. Having this taken care of can not only have you sleeping much better, it can lower your resistance of insulin. Next time you make an appointment, be sure to bring this topic up to see if you are one of the many people who suffer from Sleep Apnea. Diabetes by itself can be quite a demanding illness however if it is left unchecked or is poorly managed then serious medical complications can arise. Unfortunately some of these complications make an appearance in patients who do in fact closely monitor their diabetes and who live their lives in such a way that they successfully cope with their condition. Eye conditions such as retinopathy and glaucoma. Over time the high blood glucose levels can damage the tiny blood vessels that carry blood to the retina, which may cause them to leak fluid (nonproliferative diabetic retinopathy). This can lead to the retina becoming swollen and the vision becoming increasingly blurred (diabetic macular edema). If left untreated new blood vessels can grow on the retina’s surface which can actually cause the retina to detach. Regular eye checks at the diabetic clinic can easily detect any problems that are developing with regards to the retina so that they can be prevented from getting any worse. Numbness in the extremities i.e. the fingers and toes, that is commonly caused by peripheral nerve damage in severe diabetes (diabetic neuropathy). Because the toes and portions of the foot lose their feeling, foot ulcers can develop without the patient knowing, especially if they are more advanced in years. These foot ulcers can easily become infected and as the blood flow to the affected area is commonly impaired, they can be very difficult to heal without medical intervention. Unfortunately foot ulcers often become gangrenous and so need to be amputated for the good of the patient. Heart and blood vessel disease (cardiovascular) which surprisingly is the leading cause of death for people who have been diagnosed with diabetes. Death can come as a result of heart attacks, strokes, high blood pressure and atherosclerosis (hardening of the arteries). Kidney failure or severe damage to the kidneys that results in impaired function (diabetic nephropathy). As with the eyes, the kidneys can become damaged over time because of the high blood glucose levels. This means that the waste products that the kidneys normally filter from the blood are allowed to accumulate which in turn can cause a wide range of secondary complications. Regular urine tests at the diabetes clinic can indicate any kidney problems early on so that they can be treated and monitored efficiently. Dental disease or periodontal disease which occurs much more often in people with diabetes. Good oral hygiene and regular visits to the dentist can help with this complication. Diabetic Ketoacidosis which is a very serious outcome of poorly controlled diabetes, especially those suffering from type I. In order to prevent many of these complications it is important that diabetics go to the clinic for their regular check-ups and keep appointments with their doctor, even if they think the worrying symptom has gone away. They must also be aware of the warning signs that could be pointing to potential complications such as fatigue, problems with vision, numbness or tingling sensations in their hands and especially their feet, chest pain, bad headaches that won’t pass, persistent infections and wounds that refuse to heal, and weight gain or weight loss (more than 20 pounds). Defining Neuropathy And How It Relates To Diabetes: Diabetics have to endure various medical conditions in conjunction with their diabetes. One such condition which may occur in diabetics is neuropathy, or nerve damage as it is more commonly known. In fact, approximately 50% of diabetics will experience some type of neuropathy. The following will discuss the condition of neuropathy and how it pertains to diabetics. Neuropathy is damage which occurs to the various nerves within the body. When the nerve damage occurs as a result of the diabetes it is more specifically known as diabetic neuropathy. There are various types of neuropathy including sensorimotor neuropathy, autonomic neuropathy and focal neuropathy. Sensorimotor neuropathy is sometimes called peripheral neuropathy and can lead to tingling, pain, numbness and even weakness in the hands and feet. Autonomic neuropathy has symptoms which are a bit more serious and may consist of vomiting, bladder problems, diarrhea, digestive problems, elimination of low blood sugar warning signs, dizziness, sweat gland issues and changes in the eyes pertaining to reaction to light. As for the focal neuropathy, this type of nerve damage can lead to double vision, paralysis on the side of the face and pain throughout the body. 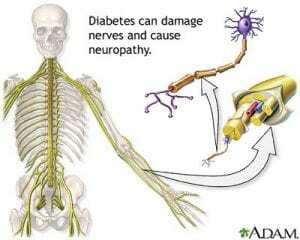 Diabetic neuropathy is caused by the frequent high blood sugar levels in the body. Those who have more episodes of high blood glucose levels will often be more likely to experience diabetic neuropathy. How much nerve damage one sustains will depend on various factors such as length of time being diabetic, severity of the diabetes and how old you are. Alcohol is another factor relating to diabetics becoming susceptible to neuropathy as those who drink a lot will be more likely to sustain nerve damage than those who have an occasional drink or do not drink at all. If you are diabetic and wondering if neuropathy is an issue for you, there are a few ways in which doctors diagnose diabetic neuropathy. Simple tests such as sensitivity to touch and temperature will be performed. More clinical tests including having an electromyogram and nerve conduction studies performed will pinpoint whether any types of nerve damage have occurred. By discussing your individual symptoms with your doctor, it will make it easier for the medical health professional to diagnose the type of nerve damage and the severity thereof. The main way to prevent the occurrence of diabetic neuropathy is to keep your blood sugar level in check. Always be sure to monitor your blood glucose level and take the insulin as soon as it is needed. Maintaining a healthy diet and engaging in a reasonable amount of exercise will help to keep your blood glucose level steady. There are a wide array of diabetic cookbooks on the consumer market these days which can help with eating healthy and enjoying your meals at the same time. It is also imperative that diabetics keep a healthy and consistent weight as this too will help to keep blood glucose levels in target range. With regard to specific treatment methods, how the nerve damage is treated will depend on the symptoms which the diabetic is experiencing. For example, those who are experiencing pain may be given pain-relieving medications and those who have digestive problems may be prescribed medicines which treat such conditions. The treatment will be on a symptom-by-symptom basis as this is the best way to deal with any problems which may arise as a result of the neuropathy. As stated above, the doctor will recommend that the individual eat healthy, exercise and maintain a target weight to keep neuropathy and its accompanying symptoms at bay.